The suprasellar area is one of the most difficult regions to approach surgically because of the crowding of vital neurovascular structures in the region. A diverse group of extradural or/and intradural lesions occur in this area [Table 1]. An approach that provides the shortest route, adequate access, minimal or no brain retraction, optimal visualization, multidirectional view, avoids crossing of neurovascular structures, as well as also interrupts the vascular supply of the tumor prior to its removal is preferred for surgical excision of these lesions. The conventional approaches to the suprasellar region include the pterional/fronto-lateral approach;,, or, the complex skull base approaches like the bifrontal basal interhemispheric or the fronto-temporo-orbito-zygomatic approach.,,,,,,,,,, The selection of the surgical approach is decided by the size, consistency, location, vascularity, the extension of the lesion as well as its relationship with neurovascular structures, and the origin or attachment of the lesion. The bifrontal basal interhemispheric approach (BBIA) provides a true midline exposure with better orientation, a wider operative field and the visualization of lesion from different perspectives. [Figure 1], [Figure 2], [Figure 3].,,,, With inferior angle of visualization from the skull base, the entire extent of the tumor located in the region of third ventricle, as well as the superior surface of the suprasellar tumors are visualized in a better way. Retraction of bilateral frontal lobes, and hence, the possibility of intellectual deterioration, as well as the contamination of surgical field consequent to opening of the frontal air sinus are the disadvantages of this approach. The fronto-temporo-orbito-zygomatic approach (FTOZ) is the workhorse of skull base surgery.,, A one- or two-piece orbito-zygomatic osteotomy , increases the surgical field of view by up to three times compared to the conventional pterional approach. The supraorbital key-hole approach provides a greater microsurgical control and freedom in dissecting tumors from vessels or nerves, and also an enhanced exposure of the lesion lateral to the internal carotid artery (ICA) and the optic nerve (ON).,, It is, therefore, the preferred approach in lesions that are adherent to neurovascular structures. There is no scope of change in the plan of the operative approach once this trajectory is adopted; therefore, a proper pre-operative planning is essential. A preoperative surface marking is performed for the skin incision, for localising the path of the supraorbital nerve and artery, the burr-hole site, to mark the extent of the craniotomy and the orientation of the Sylvian fissure. A 3-4cm skin incision is given in the upper half and lateral two-third of the eyebrow ipsilateral to the tumor. A 3 cm × 2.5 cm free bone flap is raised and the inner table and juga cerebralia (impressions of the cerebral gyri on the inner surface of the skull) are drilled. After opening the dura, the microscope and/or endoscope is used and the Sylvian fissure is opened in an antegrade fashion from medial to lateral aspect. The SOKHA has the following advantages.,, It is a minimally invasive approach utilizing a small skin incision, minimal temporalis muscle dissection, and an extremely small and low lying craniotomy along the frontal base. Shaving of hair over the head at the site of craniotomy is also avoided. There is very little brain retraction utilizing this approach. There is also minimum brain exposure minimizing the chances of injury to the normal brain. It has been determined that the standard pterional approach with a 8cm craniotomy exposes approximately 50.27 cm2 of the underlying brain, whereas the key-hole approach with a 2cm craniotomy exposes only approximately 3.14 cm2 of the brain surface. This prevents an excessive exposure of the brain tissue for several hours during the performance of the surgery and prevents it from being vulnerable to injury. This approach is safe and cost-effective, and has a low morbidity. In the patient, it results in a rapid recovery, with a smooth postoperative course, shorter hospital stay and a pleasing cosmetic skull opening. SOKHA is technically demanding, and hence, a gradual stepwise progression from the pterional to the minipterional to the SOKHA approach is the key to the shortening of learning curve.,,, Also, in order to avoid morbidity during the initial phase, it should be utilized for simpler lesions like excision of an epidermoid [Figure 4]. In aneurysm surgery utilizing the SOKHA, the dissection commences with ICA exposure, which also provides proximal control of the parent artery in case the aneurysm ruptures prematurely. The possibility of a catastrophic aneurysmal rupture and the need to undertake an emergent proximal and distal control of the parent artery harbouring the aneurysm has to be kept in mind throughout surgery. Any fear of having to tackle an intra-operative rupture of the aneurysm in the narrow and confined space can be minimized by an early and wide opening of the Sylvian and the carotid cistern before tackling the neck of the aneurysm. The ICA, as well as the M1 segment of the middle cerebral artery, and both A1 segments of the anterior cerebral artery should be dissected and prepared for an appropriate proximal clipping. One must practice temporary vessel occlusion of the parent artery using temporary clips several times before reaching the aneurysm; and, the dissection in close proximity to the aneurysm should be performed with the temporary clips occluding the proximal and distal parts of the parent vessel. This minimally invasive procedure is contraindicated in acute subarachnoid haemorrhage, or in the case where a complex or giant aneurysm is present. Aneurysm surgery through a key-hole should be attempted only after one has significant experience in microscopic clipping of numerous aneurysms [Figure 5]. Chiasmal gliomas: The SOKHA is the preferred approach. Simple anterior circulation aneurysms: The SOKHA is the preferred approach. Surgical approach for the suprasellar lesions must be individualized. Skull base approaches have their own place and are reserved for large and firm lesions; in extensive lesions often with multicompartmental projections; in lesions causing encasement of the ICA or the optic nerve; in lesions invading the cavernous sinus and/or the orbit; and, in lesions with a large dural attachment and/or extensive bony changes. With the availability of stereotactic radiosurgery, a generally less aggressive approach for lesions infiltrating the lateral wall of the cavernous sinus is adopted. Awareness of the need for an early diagnostic imaging; as well as advances in the various modalities of imaging, permit an early diagnosis of these lesions when they are still of moderate size and, therefore, may be treated with minimally invasive approaches using a microcrope or an endoscope. Advances in neuronavigation and endoscopic equipment have permitted the treatment of these lesions through smaller surgical corridors, and more specifically, less traumatic approaches. Suri A, Narang KS, Sharma BS, Mahapatra AK. Visual outcome after surgery in patients with suprasellar tumors and preoperative blindness. J Neurosurg 2008;108:19-25. Samii M, Tatagiba M. Craniopharyngioma, In: Kaye AH, Laws ER Jr, editors. Brain Tumors: An Encyclopedic Approach. Edinburgh: Churchill Livingstone; 1995. p. 873-94. Yasargil MG, Curcic M, Kis M, Siegenthaler G, Teddy PJ, Roth P. Total removal of craniopharyngiomas. Approaches and long-term results in 144 patients. J Neurosurg 1990;73:3-11. Mishra S, Srivastava AK, Kumar H, Sharma BS. Reshaping the zygomatic complex: A “small step” in frontotemporal craniotomy and a “big leap” in exposure. Neurol India 2015;63:723-6. Sinha S, Kumar A, Sharma BS. Bifrontal basal interhemispheric approach for midline suprasellar tumors: Our experience with forty-eight patients. Neurol India 2013;61:581-6. Gupta SK, Khosla VK, Sharma BS. Bilateral fronto-orbito-zygomatic craniotomy - A combined extended frontal and orbitozygomatic approach. Neurol India 2000;48:361-4. Gupta SK, Khosla VK, Sharma BS. Pure extradural approach for skull base lesions. Neurol India 1999;47:300-3. Gupta SK, Sharma BS, Pathak A, Khosla VK. Single flap fronto-temporo-orbito-zygomatic craniotomy for skull base lesions. Neurol India 2001;49:247-52. 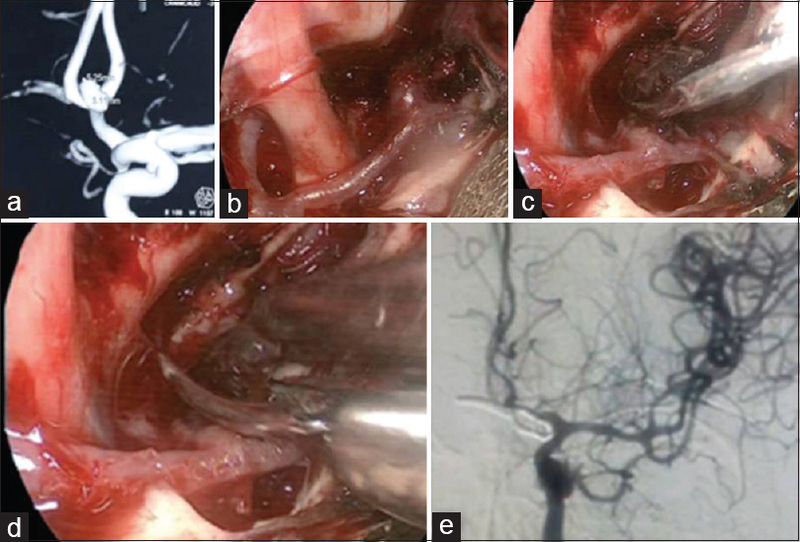 Shibuya M, Takayasu M, Suzuki Y, Saito K, Sugita K. Bifrontal basal interhemispheric approach to craniopharyngioma resection with or without division of the anterior communicating artery. J Neurosurg 1996;84:951-6. 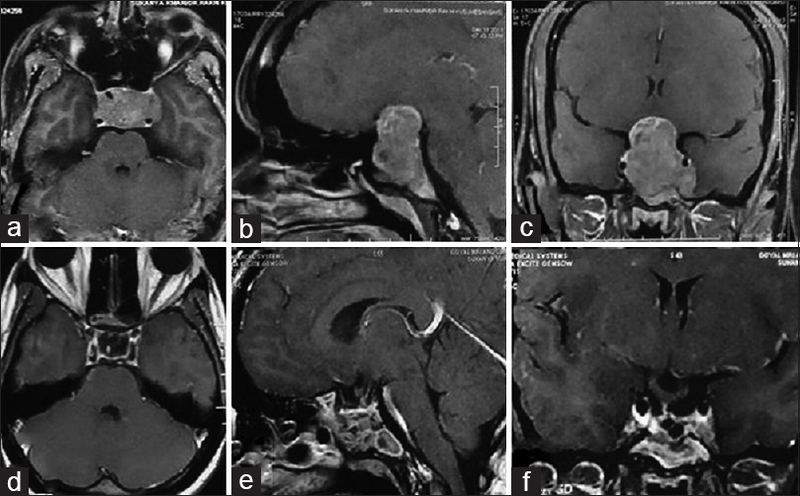 Shirane R, Ching-Chan S, Kusaka Y, Jokura H, Yoshimoto T. Surgical outcomes in 31 patients with craniopharyngiomas extending outside the suprasellar cistern: An evaluation of the frontobasal interhemispheric approach. J Neurosurg 2002;96:704-12. Yasui N, Nathal E, Fujiwara H, Suzuki A. The basal interhemispheric approach for acute anterior communicating aneurysms. Acta Neurochir 1992;118:91-7. Seçkin H, Avci E, Uluç K, Niemann D, Başkaya MK. The work horse of skull base surgery: Orbitozygomatic approach. Technique, modifications, and applications. Neurosurg Focus 2008;25:E4. Tripathi M, Deo RC, Damodaran N, Suri A, Srivastav V, Baby B, et al. 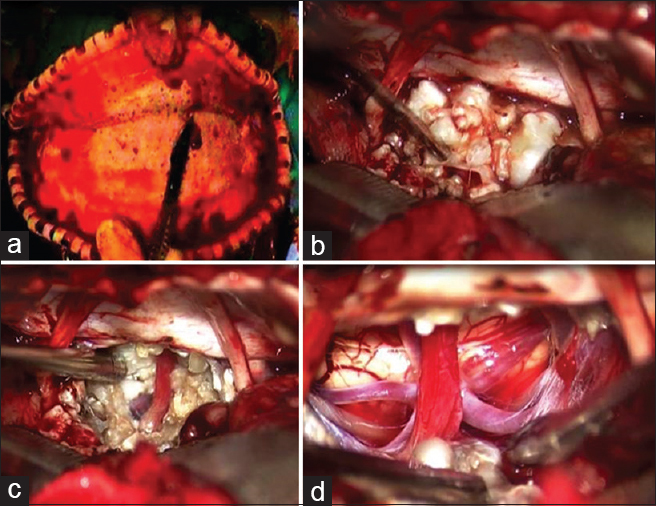 Quantitative analysis of variable extent of anterior clinoidectomy with intradural and extradural approaches: 3-dimensional analysis and cadaver dissection. Neurosurgery 2015;11 Suppl 2:147-61. Du C, Feng CY, Yuan X, Liu Q, Peng Z, X Jiang X, et al. Microsurgical management of craniopharyngiomas via a unilateral subfrontal approach: A retrospective study of 177 continuous cases. World Neurosurg 2016; 90:454-68. 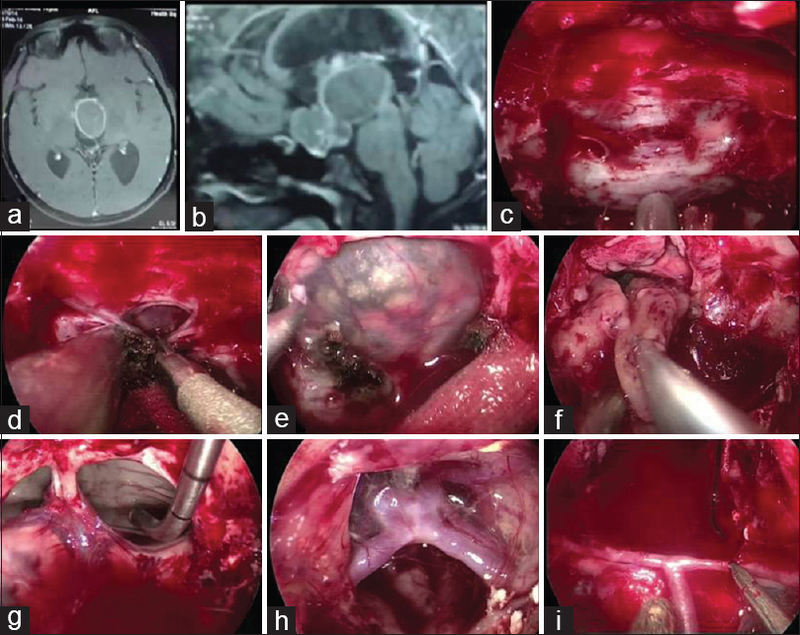 Koutourousiou M, Fernandez-Miranda JC, Stefko ST, Wang EW, Snyderman CH, Gardner PA. Endoscopic endonasal surgery for suprasellar meningiomas: Experience with 75 patients. J Neurosurg 2014;120:1326-39. Sharma BS, Kumar A, Sawarkar D. Endoscopic controlled clipping of anterior circulation aneurysms via keyhole approach: Our initial experience. Neurol India 2015;63:874-80. 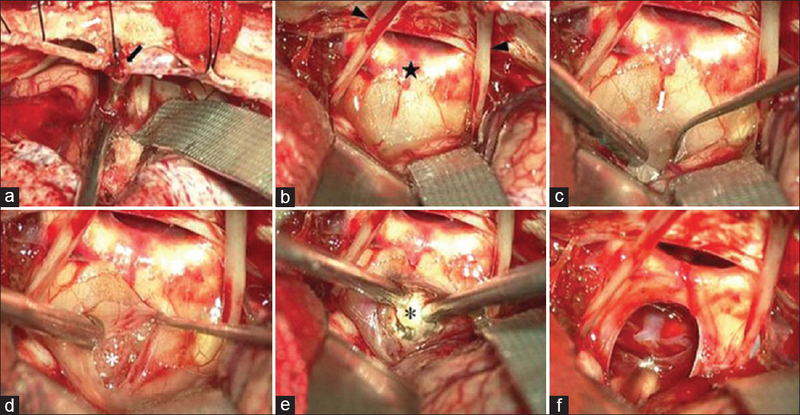 Perneczky A, Reisch R. Keyhole approaches in neurosurgery- concept and surgical technique. Springer Verlag-Wien: NewYork; 2008. pp 3-36. Sankhla SK, Jayashankar N, Khan GM. 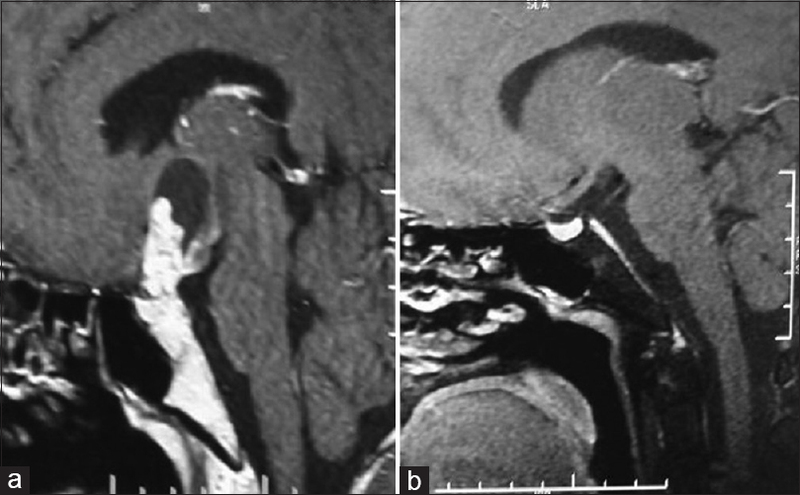 Surgical management of selected pituitary macroadenomas using extended endoscopic endonasal transsphenoidal approach: Early experience. Neurol India 2013;61:122-30. Perneczky A, Muller-Forell W, Lindert E, Fries G. Current strategies in keyhole and endoscope-assisted microneurosurgery. In: Perneczky A, editor. Keyhole Concept in Neurosurgery. Stuttgart: Thieme Medical Publishers; 1999. p. 37-51. Cheng CM, Noguchi A, Dogan A, Anderson GJ, Hsu FP, McMenomey SO, et al. Quantitative verification of the keyhole concept: A comparison of area of exposure in the parasellar region via supraorbital keyhole, frontotemporal pterional, and supraorbital approaches. J Neurosurg 2013;118:264-9. Cavallo LM, de Divitiis O, Aydin S, Messina A, Esposito F, Iaconetta G, et al. Extended endoscopic endonasal transsphenoidal approach to the suprasellar area: Anatomic considerations-part 1. Neurosurgery 2007;61(3 Suppl):24-34.
de Divitiis E, Cavallo LM, Cappabianca P, Esposito F. Extended endoscopic endonasal transsphenoidal approach for the removal of suprasellar tumors: Part 2. Neurosurgery. 2007;60:46-59. 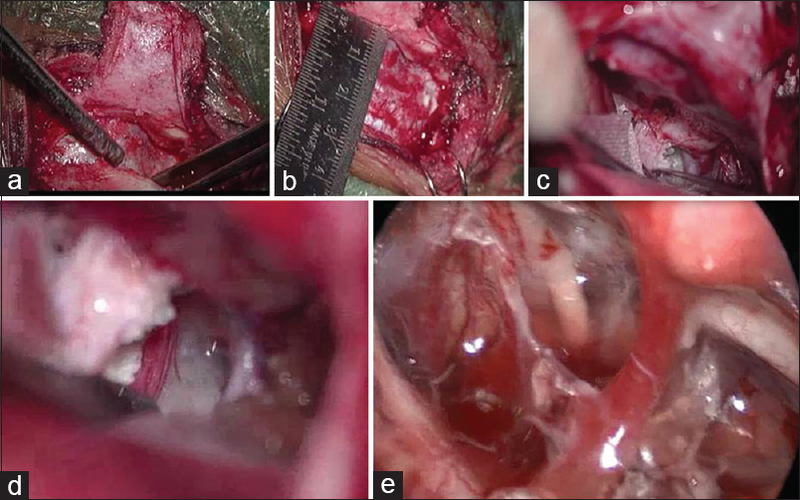 Dehdashti AR, Ganna A, Witterick I, Gentili F. Expanded endoscopic endonasal approach for anterior cranial base and suprasellar lesions: Indications and limitations. Neurosurgery 2009;64:677-89. Tan SH, Brand Y, Prepageran N, Waran V. Endoscopic transnasal approach to anterior and middle cranial base lesions. Neurol India 2015;63:673-80. Sharma BS. The philosophy of 'middle path' in neurosurgery. Neurol India 2016;64:208-14. Solari D, Cavallo LM, Somma T, Chiaramonte C, Esposito F, Del Basso De Caro M, et al. Endoscopic endonasal approach in the management of Rathke's cleft cysts. PLoS ONE 2015;10: e0139609. Schroeder HWS. Indications and limitations of the endoscopic endonasal approach for anterior cranial base meningiomas. World Neurosurg 2014;82:S81-S85. Marx S, Clemens S, Schroeder HWS. The value of endoscope assistance during transcranial surgery for tuberculum sellae meningiomas. J Neurosurg 2017:1-8. doi: 10.3171/2016.11.JNS16713. Solari D, Morace R, Cavallo LM, Amoroso F, Cennamo G, Del Basso De Caro M, et al. 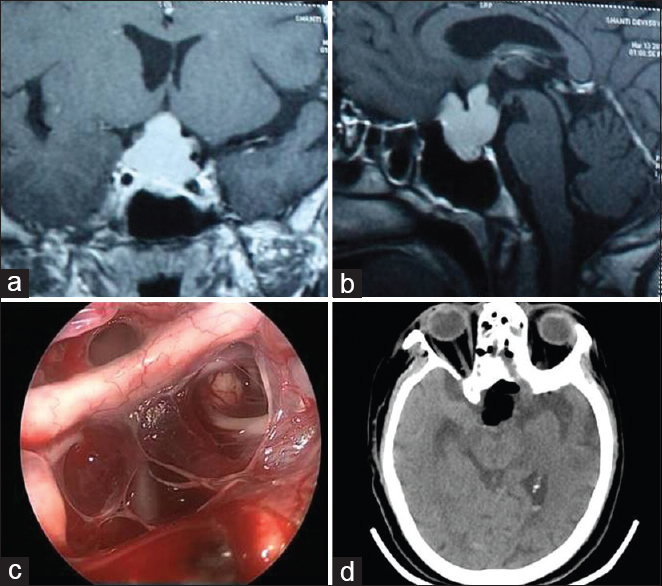 The endoscopic endonasal approach for the management of craniopharyngiomas. J Neurosurg Sci 2016;60:454-62. Messerer M, Cossu G, Pasche P, Ikonomidis C, Simon C, Pralong E, et al. Extended endoscopic endonasal approach to clival and paraclival tumors: Indications and limits. Neurochirurgie 2016;62:136-45. Mohyeldin A, Prevedello DM, Jamshidi AO, Ditzel Filho LF, Carrau RL. Nuances in the treatment of malignant tumors of the clival and petroclival region. Int Arch Otorhinolaryngol 2014;18(Suppl 2):S157-72. Yadav YR, Sachdev S, Parihar V, Namdev H, Bhatele PR. Endoscopic endonasal trans-sphenoid surgery of pituitary adenoma J Neurosci Rural Pract 2012;3:328-37. Wilson DA, Duong H, Teo C, Kelly DF. The supraorbital endoscopic approach for tumors. World Neurosurg 2014;82 (6 Suppl):S72-80.